Background/aims To evaluate the perception of three-dimensional (3D) shape in patients with strabismus and the contributions of stereopsis and monocular cues to this perception. Methods Twenty-one patients with strabismus with and 20 without stereo acuity as well as 25 age-matched normal volunteers performed two tasks: (1) identifying the closest vertices of 3D shapes from monocular shading (3D-SfS), texture (3D-SfT) or motion cues (3D-SfM) and from binocular disparity (3D-SfD), (2) discriminating 1D elementary features of these cues. Results Discrimination of the elementary features of luminance, texture and motion did not differ across groups. When the distances between reported and actual closest vertices were resolved into sagittal and frontoparallel plane components, sagittal components in 3D-SfS and frontoparallel components in 3D-SfT indicated larger errors in patients with strabismus without stereo acuity than in normal subjects. These patients could not discriminate one-dimensional elementary features of binocular disparity. Patients with strabismus with stereo acuity performed worse for both components of 3D-SfD and frontoparallel components of 3D-SfT compared with normal subjects. No differences were observed in the perception of 3D-SfM across groups. A comparison between normal subjects and patients with strabismus with normal stereopsis revealed no deficit in 3D shape perception from any cue. Conclusions Binocular stereopsis is essential for fine perception of 3D shape, even when 3D shape is defined by monocular static cues. Interaction between these cues may occur in ventral occipitotemporal regions, where 3D-SfS, 3D-SfT and 3D-SfD are processed in the same or neighbouring cortical regions. Our findings demonstrate the perceptual benefit of binocular stereopsis in patients with strabismus. Perceiving three-dimensional (3D) shapes involves computing spatial derivatives of depth, which can be derived from both monocular and binocular disparity cues.1–3 Hence, binocular disparity cues and monocular cues including texture, shading and motion contribute to the perception of 3D shapes.1 4 5 A series of studies in human and nonhuman primates were used to characterise the neuronal mechanisms underlying the processing of monocular and binocular cues contributing to the perception of 3D shapes.1 6 7 The processing of 3D shape from shading (3D-SfS), texture (3D-SfT), motion (3D-SfM) or binocular disparity (3D-SfD) overlaps in many regions of inferior temporal and parietal cortex,1 6–8 suggesting that the respective visual cues interact in the extraction of 3D shape. Strabismus is a misalignment of the eyes eventually resulting in a deficit or loss of binocular stereopsis.2 The interaction between reduced binocular stereopsis and motion cues has been reported in patients with strabismus; patients with diminished or no binocular stereopsis can still perceive motion in depth.9 10 The well-studied underlying mechanism involves the processing of dynamic rather than static disparity information.11 Moreover, sundry adverse effects of reduced binocular stereopsis on visuomotor skills including eye-hand coordination,12 13 fine motor skills14 15 and visually guided reaching16 17 have been reported as an aspect of visual guidance for action. However, the long-term effects of a strabismic condition on static 3D shape perception, possibly resulting in reduced or no binocular stereopsis, remain unclear. A recent study has characterised 3D shape perception in patients with brain dysfunctions.18 The present study, employing the same stimuli and similar tasks, examines differences in 3D shape perception between normal and subjects with strabismus and assesses the inter-relationship between binocular stereopsis and the 3D shape perception of monocular shading, texture and motion cues. To exclude the interpretation that 3D shape perception was affected by perceptual deficits in the low-level visual representations of elementary features, two tasks were introduced in this experiment: perception of 3D shapes and discrimination of elementary features. Forty-one patients with strabismus (mean±SD age, 22.3±16.2 years; range, 6–65 years) and 25 age-matched normal volunteers as control (mean±SD age, 21.0±17.6 years; range, 6–63 years) participated in the study. All participants had normal or corrected-to-normal vision in both eyes (visual acuity≥20/20). Stereo acuity was evaluated with the Titmus stereo test. The stereopsis of normal volunteers ranged from 40 to 60 arc-s. Patients with horizontal strabismus , with esotropia, intermittent exotropia or constant exotropia and at least 1 year of strabismus history were included in the study. The patients with strabismus were divided into two groups: ‘strabismus-with-stereo’ (stereo acuity from 40 to 800 arc-s, n=21; mean±SD age, 19.0±18.6 years old) and ‘strabismus-without-stereo’ (no stereo acuity, n=20; mean±SD age, 25.7±12.8 years). All participants provided written informed consent in accordance with the Declaration of Helsinki. For participants<20 years old, parental authority was obtained after being given a detailed description of the experimental protocol. We used the modified visual stimuli and tasks of Gillebert et al.18The tasks involved the perception of images containing 3D shapes, tested twice and discriminating 1D elementary features, tested once. The stimuli were presented on a 13-inch LCD monitor (resolution, 1920×1080 pixels with a 60 Hz refresh rate) with participants seated 40 cm from the screen. Stimulus presentation and response registration were controlled by a personal computer using in-house software written in Presentation 11.3 (Neurobehavioral Systems, Albany, California, USA). The visual stimuli were created and rendered in four modalities (3D-SfS, 3D-SfT, 3D-SfM and 3D-SfD).18 These stimuli depicted 11 randomly generated, complex 3D surfaces.1 5 6 One example is shown in figure 1A. Stimuli from each of four modalities (figure 1B–E) were presented in a block design consisting of 11 trials showing 11 different 3D shapes once each per block in random order. The participants wore red/blue anaglyph glasses when 3D-SfD was displayed. A single 3D shape image (average size, 9°×9°) was presented in the centre of the screen on a blue (3D-SfS, 3D-SfT and 3D-SfM) or black (3D-SfD) background. Subjects viewed the stimuli binocularly and had to identify the foremost vertices in the 3D shapes (the highest convex point or global maximum) as accurately as possible, superimposing the red cross using the computer mouse. The difference between the global curvature maximum as identified by the participant and the true global maximum yielded a 3D vector (error vector). Selecting the second-highest convex point at different positions results in a small error in depth but drastically different in frontoparallel position. Hence, components of the sagittal plane representing ‘error in depth’ (cm) and components of the frontoparallel plane representing ‘in-plane distribution of errors’ were analysed separately.18 In the 3D-SfD, these results were compared only between the control and strabismus-with-stereo groups, because the strabismus-without-stereo group could not distinguish the elementary features of binocular disparity. The error in depth for each cue was analysed separately, due to the absence of data for 3D-SfD in the strabismus-without-stereo group. Repeated-measure analysis of covariance was used for each group of participants, with the number of measurements (two) as factors and age as a covariate. The threshold of statistical significance was determined using Holm’s methods.19 For n distinct tests (in this case, n=4), the Holm method compares the kth smallest P value (for k=1,2…,n) among the original P values with adjusted P value of 0.05/(n-k +1) until the kth smallest P value exceeds the adjusted P value. When the kth smallest P value is smaller than the adjusted P value, the P value is considered as statistically significant. The distribution of responses in the frontoparallel plane was analysed by computing covariance ellipses containing 95% of the subjects’ responses within a group for a given 3D surface.18 A property of the ellipse representing its size (mean of the two eigenvalues of ellipses) is a measure of the response variability within a group and is most sensitive for detecting differences.18 The ellipse size was also analysed independently for each cue using repeated measure analysis of variance (ANOVA) for each group of participants and with the number of measurements (two) as factors, using a significance threshold adjusted according to Holm’s method. (A) A depth-colour map of a 3D shape stimulus. The colour bar indicates the depth differences (cm) from the bottom of the visual stimulus (indicated by a blue area) (B–E). 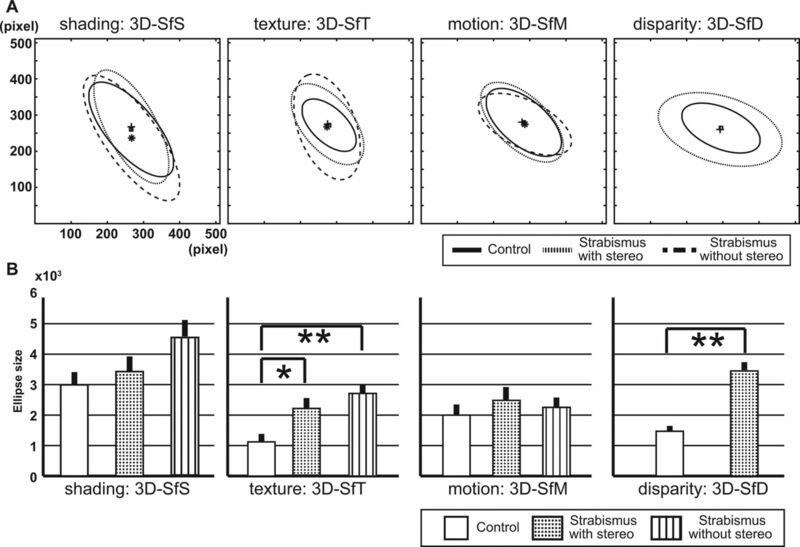 3D shape extraction from monocular cues, shading (B), texture (C), motion (D) and from binocular disparity (E) and the responses of control subjects (red points for 3D-SfS, 3D-SfT and 3D-SfM, yellow points for 3D-SfD) (F–I). Examples of elementary feature discrimination for each feature, luminance (F), texture coarseness (G), speed of motion (H) and binocular disparity (I). 3D, three-dimensional; 3D-SfD, 3D shape from disparity; 3D-SfM, 3D shape from motion; 3D-SfS, 3D shape from shading; 3D-SfT, 3D shape from texture. Two squares (5.7°×5.7°) were presented simultaneously on the monitor, bilaterally, on either side of the fixation point (figure 1F–I).18 Each square consisted of either a single luminance value, texture coarseness, speed of motion or disparity (through the red/blue anaglyph glasses). Three saliency levels (differences: 15% in luminance, 20% in texture coarseness, 20% in speed of motion and 0.12° in disparity) were shown for each cue. For each cue, there are three combinations, derived from different saliency levels. Two squares from each combination were presented bilaterally four times consisting of 12 trials. In addition, in the ‘same’ condition, the identical stimulus level was presented bilaterally three times as three trials. In total, 15 trials for each cue were presented in random order in a block design. After a 400 ms interval following onset of the red cross which appeared at the beginning and remained throughout the trial, a two-square visual stimulus was displayed for 6 s on a black background. The participants were required to decide whether one of the squares had a brighter luminance, coarser texture, faster motion or was closer to the participants in depth than the other or if both were the same by pressing the right, left or middle button. If accuracy for the motion, texture or luminance cue was below chance (33%), the participant was excluded from the study. For the binocular disparity cue, only the results of the control and strabismus-with-stereo groups were compared, because accuracy for all strabismus-without-stereo subjects was below chance level. The accuracy was analysed using ANOVA (in monocular cues) or the t-test (in disparity cue) with the subject group as a factor, at a significance threshold of the Holm-adjusted P value. Accuracy in the feature discrimination task did not differ across the three participant groups for the three monocular cues (table 1). For the binocular disparity cue, accuracy was significantly poorer in the strabismus-with-stereo group than in the control group. Linear regression analysis showed a significant correlation between accuracy in the feature discrimination task using binocular disparity as the cue and stereo acuity in the strabismus-with-stereo group (R=0.7065; P=0.0003). Example of the control group’s responses to the presentation of a 3D shape is shown in figure 1B–E. Even when the surface was presented using different cues, responses clustered in the frontoparallel plane near the true global maximum of the 3D surface, as illustrated in the depth-colour map on the 3D surface of the example (figure 1A). If the participant could not perceive the 3D shapes well, the response distribution tended to be random, resulting in a large area including most of the front surface of the 3D shapes. On the other hand, if the responses clustered at different points of the plane, they captured perceptual differences, reflecting uncertainty about locations in depth between the groups. The frontoparallel plane distributions of the responses were compared across the groups. For each monocular cue, an average ellipse was calculated across the 11 surfaces. These average ellipses (figure 2A) and the sizes of these averaged ellipses (figure 2B) were then compared across the groups. Shapes and centre points of the average ellipses were similar (figure 2A). For the 3D-SfS condition, the size from the strabismus-without-stereo group was 1.5 times larger than that for the control group, though the difference did not reach statistical significance for the 3D-SfS condition (F[2, 30]=1.437, P=0.254). For the 3D-SfT condition, the size of the strabismus-with-stereo and strabismus–without-stereo were 2 and 2.5 times larger than those of the control group, respectively (F[2, 30]=4.911, P=0.014, adjusted threshold of P=0.0167). Posthoc comparisons indicated that these differences were statistically significant (P=0.045 and P=0.005 Bonferroni-corrected, respectively). For the 3D-SfM condition, size did not differ across the groups (F[2, 30]=0.257, P=0.775). However, the size of the strabismus-with-stereo group was larger than for the control group in the 3D-SfD condition (F[2, 30]=23.069, P<0.001 adjusted threshold of P=0.0125). (A) Comparison of the average ellipses and their centres for each cue for control (solid line and small squares), strabismus-with-stereo (dotted line and small pluses) and strabismus-without-stereo (dashed line and small asterisks) groups. (B) Comparison of average ellipse sizes between control (white bar), strabismus-with-stereo (stippled bar) and strabismus-with-stereo (striped bar) groups. The error bar indicates SE. Statistically significant differences indicated by *P<0.05 or **P<0.01. 3D, three-dimensional; 3D-SfD, 3D shape from disparity; 3D-SfM, 3D shape from motion; 3D-SfS, 3D shape from shading; 3D-SfT, 3D shape from texture. The sagittal component of the error vector was calculated and compared across the groups (figure 3). A significant effect of error in depth was found in the 3D-SfS condition (F[2, 722]=7.605; P=0.001, adjusted threshold of P=0.0167) and the error in depth of the strabismus-without-stereo group was larger than that of the control group (P<0.001, Bonferroni method). Although not reaching statistical significance, a comparison of the three groups’ results for the 3D-SfT condition (F[2, 722]=2.07; P=0.13) showed that the error in depth tended to be greater for the two strabismus groups than for the control group. No differences between groups were found in the 3D-SfM condition (F[2, 722]=1.325, P=0.27). In the 3D-SfD condition, the error in depth of the strabismus-with-stereo group was greater than that of the control group (F[1, 503]=22.159; P<0.001, adjusted threshold of P=0.0125) and was more obvious than for the other cues. In addition, a regression analyses for stereo acuity and error in depth were performed in the strabismus–with-stereo group. A correlation was found in the 3D-SfD condition (R=0.35, P<0.001) and weak correlation was also found in the 3D-SfS condition (R=0.1, P=0.031). However, there was no significant correlation in the 3D-SfM condition (R=0.07, P=0.14) or in the 3D-SfT condition (R=0.02, P=0.6). 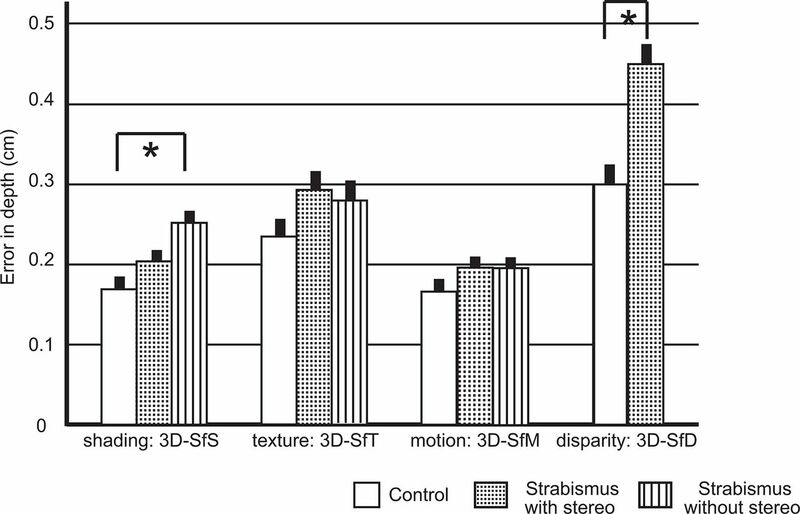 Error in depth (cm) of 3D shape perception of control (white bar), strabismus-with-stereo (stippled bar) and strabismus-without-stereo (striped bar) groups. The asterisk indicates a statistical significance. The error bar shows SE. 3D, three-dimensional; 3D-SfD, 3D shape from disparity; 3D-SfM, 3D shape from motion; 3D-SfS, 3D shape from shading; 3D-SfT, 3D shape from texture. To assess whether these differences resulted from the strabismus itself or from reduced binocular stereo acuity, we evaluated both the frontoparallel plane distributions and error in depth for a subgroup of patients with strabismus: those 13 patients with a normal range of stereo acuity (40–60 arc-s) and those of 16 control age-matched subjects. In-plane distribution of errors represented by the averaged ellipses for each cue extensively overlapped for the two groups (figure 4A) and ellipse size did not differ significantly between groups (online supplementary table 1). In addition, error in depth did not differ between two groups for any of the cues (figure 4B), F[1, 316]=2.87, P=0.091 in the 3D-SfS condition; F[1, 316]=1.189, P=0.276 in the 3D-SfT condition; F[1, 316]=0.924, P=0.337 in the 3D-SfM condition and F[1, 316]=0.127, P=0.721 in the 3D-SfD condition). Comparison between control subjects and patients with strabismus with normal range of stereo acuity. (A) Average ellipses and their centres for each cue for control (solid line and small squares) and strabismus (dotted line and small pluses) subjects. (B) Error in depth in control (white bar) and strabismus (grey bar) subjects. The error bar indicates the SE. 3D, three-dimensional; 3D-SfD, 3D shape from disparity; 3D-SfM, 3D shape from motion; 3D-SfS, 3D shape from shading; 3D-SfT, 3D shape from texture. 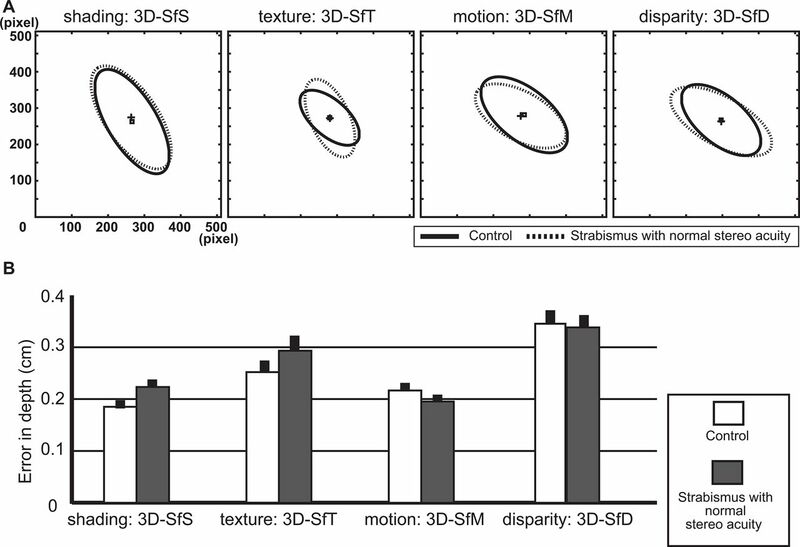 This study revealed distinct differences in 3D shape perception between normal and subjects with strabismus: strabismus-without-stereo group perceived monocularly defined 3D shapes poorly, producing larger sagittal error components in the 3D-SfS condition and larger frontoparallel error components in the 3D-SfT condition. Strabismus-with-stereo group presented deficits in both planes for the 3D-SfD condition and frontoparallel errors for the 3D-SfT condition. These deficits were related to the binocular stereopsis, not strabismus itself. On the other hand, perception of the 3D-SfM condition was not related to alterations in binocular stereo acuity. Accuracies in the feature discrimination tasks indicated no differences across the three groups for monocular cues. Hence, it can be assumed that the differences in 3D shape perception as defined by these monocular cues cannot be attributed to the low-level visual processing of such elementary features. However, the sensitivity of the feature discrimination tasks in assessing the processing of low-level features was limited, since we did not employ the QUEST procedure18 which allows an estimation of the threshold.20 Therefore, we cannot exclude the possibility that abnormal low-level visual processing affected 3D shape perception in the subjects with strabismus, especially those in the without-stereo group, who may have some degree of amblyopia. Indeed, low-level visual processing abnormalities in patients with amblyopia have been reported.21 22 Moreover, poor accuracy in the disparity feature discrimination tasks clearly confirms that significant impairments exist in patients with strabismus as a consequence of deficits in the low-level processing of binocular disparity. In conclusion, reduced or absent binocular stereopsis coarsened perception of 3D-SfS and 3D-SfT. Binocular stereopsis is proposed to play an important role in interacting with these monocular cues when processed by ventral cortical regions. The benefits of binocular stereopsis for visuomotor skills have been previously reported,12–17 but supplementary to these reports, our findings demonstrate a perceptual aspect to the benefits of binocular stereopsis in patients with strabismus. The present techniques could be used in future studies to assess the effect of surgery, which often improves binocular stereopsis,25 26 on depth perception. We thank Professor Rik Vandenberghe (Laboratory for Cognitive Neurology, Department of Neurosciences, KU Leuven 3000 Leuven, Belgium) for visual stimuli. We also thank Dr Steven Raiguel for valuable comments and English corrections on the manuscripts.
. A systematic comparison of static and dynamic cues for depth perceptionstatic and dynamic cues for depth perception. Investigative ophthalmology & visual science 2016;57:3545–53.
. A simple sequentially rejective multiple test procedure. Scandinavian Journal of Statistics 1979;6:65–70. Contributors Research design: HS, CRG, JTT and GAO. Data acquisition and statistical analysis: HS. Writing of manuscript: HS, CRG and GAO. Final approval of manuscript: all authors. Funding This work was supported by Japan Society for the Promotion of Science (JSPS) KAKENHI Grant Number JP16K11319 and JP15KK0333, Takeda Science Foundation, Charitable Trust Fund for Ophthalmic Research in Commemoration of Santen Pharmaceutical’s Founder (HS). CRG was supported by a Sir Henry Wellcome Postdoctoral Fellowship (098771/Z/12/Z). Ethics approval The Ethics Committee of Tokyo University Hospital.